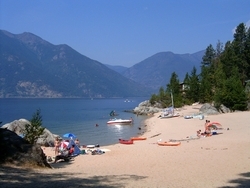 Kootenay Lake, and the surrounding mountain parks, provide one of the most popular recreation areas in the British Columbia. Set in a valley at the base some of the province's most spectacular wilderness, Kootenay Lake is easily accessible from several communities and offers a myriad of possibilities for enjoyment and recreation - summer and winter. The main lake is long and narrow, stretching for more than 100 km north from Creston. The highway switches from the east shore to the west about half way up and is linked by a charming ferry trip that crosses from Kootenay Bay to Balfour. 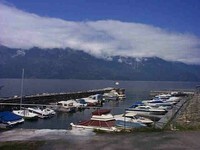 From there travellers can take the road along the west arm of Kootenay Lake, to the fabled town of Nelson, or continue north to the communities of Ainsworth Hot Springs and Kaslo. Along the way, sightseeing and camping opportunities abound. Visitors can chose between a quite B&B, RV sites, or wilderness camping at lake's edge; they can spend a day swimming or windsurfing; fishing or even SCUBA diving in the crystal clear waters; playing golf or white-water rafting. From lake level, there is road access to numerous trails. These can lead to light day hikes suitable for families, or rise thousands of feet into glaciated peaks, for vigourous, multi-day adventures into the Kootenay wilderness. There are six alpine parks with drainages into Kootenay Lake. Wildlife viewing opportunities abound, with protected wetlands, lush valleys, alpine meadows and ridges. In winter, skiers can be confident in knowing that Powder Magazine named the Nelson/Kootenay Lake area one of the "20 Best Places To Live To Ski" in North America. Whether you choose to take a wilderness tour, a day paddle, or a multi-day trip, the serene waters of Kootenay Lake will seduce your senses and wash away cares. 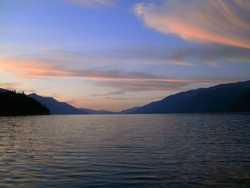 Kootenay Lake is best accessed from the south, off Highway 3.